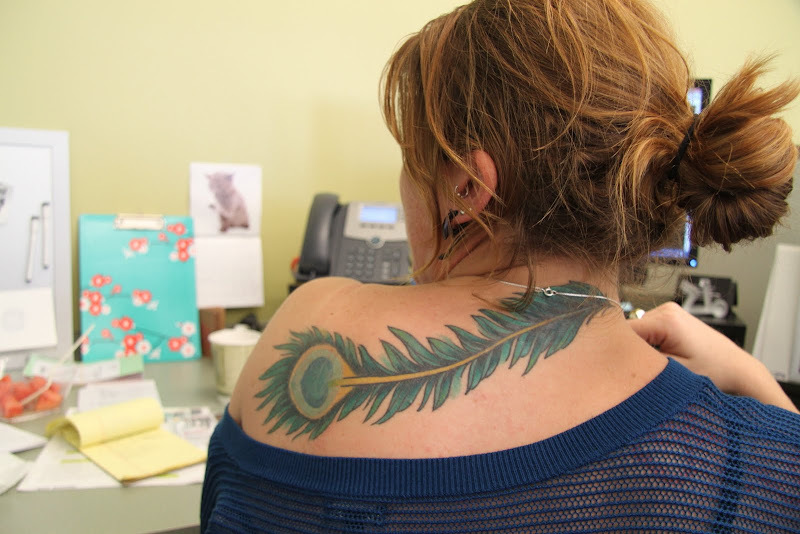 feathers are the common denominator for today's tattoo tuesday. saturday's errands included a stop at visible voice books - a wonderful independent bookshop in cleveland. 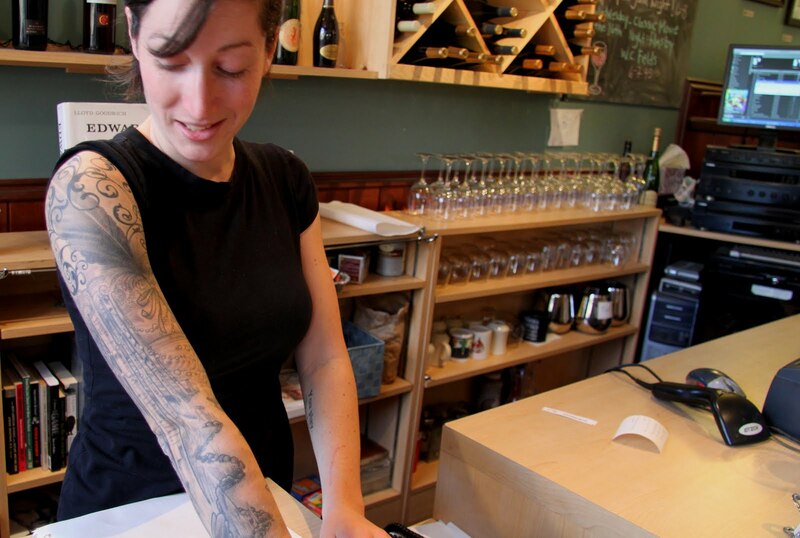 while checking out i was taken by the artful sleeve of aubrey who was working the shop that day. of course, i asked permission to take a snap and when she graciously gave permission to snap and share, i asked her the story behind the work. aubrey says that the piece reflects her worldview and the inspiration for the artwork are the poems of robert frost. the feather on aubrey's arm is a feather pen - if you look closely and perhaps enlarge the photo on the right you may see the nib) i didn't probe her on the specific poems as we began discussing where she had the work done, how long it took and who did it. she had the work done while living and studying in san francisco, because it is so intricate the work took quite a few sessions and was done by a tattoo artist named barnaby. below is another feather - mallory supplies the canvas for this colorful feather. oh by the way, while at visible voice i picked up two woody guthrie books - a replacement copy for my lost 30 year old edition of woody's autobiography bound for glory and a gently used copy of pastures of plenty: the unpublished writings of woody guthrie (edited by dave marsh and harold leventhal). if you haven't noticed, there's a new addition on the mouse's sidebar - to celebrate the upcoming centennial of woody's birth in 2012, i have added a link to the guthrie foundation site which features a woody song a day! norah jones performing light as a feather - norah and singer-songwriter ryan adams wrote the song together. the song appears on jones 4th studio album, the fall (2009). I love the Frost poem but......please always give if possible. I always learn something new here, mouse! And... I just gotta get a tatoo! Perhaps a little mouse! Frost has always been a favorite. Living in NH brings him close too. Norah is lovely. Her voice, her music. Another poet. It's interesting that she chose a feather to represent the poetry of Frost. I would have thought a maple leaf, or a wall, or a tree, or a barn would have been more apt! But hey, whatever brings him to mind for her, that's what matters! More and more I think that good connections are the prime ingredient of a good blog-post. 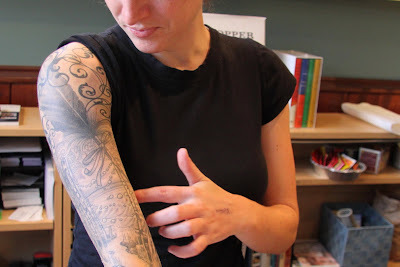 The way a really satisfying and well-written post drifts from subject to subject (body art to feathers) and from media to media (word to image to music). Good blogs do this better than any other medium. steve - the photo of aubrey's arm doesn't do the full work justice - there are stone walls, leaves, clouds, trees, a path and much much more included in the sleve.